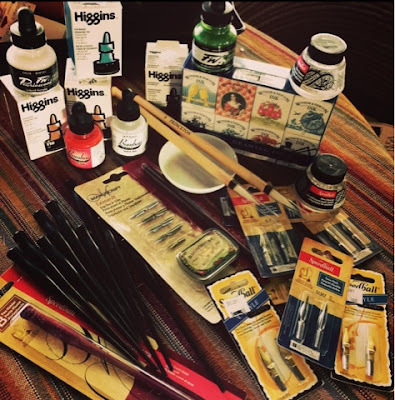 Every artist I know loves new art supplies. I get the treat of gifting my students new art supplies from time to time. I feel just like Santa Clause. We start an ink unit each fall. This year I decided to introduce my students to dip pens and different kinds of waterproof and water soluble inks. I haven't really played with ink washes and dip pens since college a million years ago. I actually burned out with ink washes back in the dark ages. We did all our commercial art and design work in black ink washes before color printing became economical and universally possible. After I graduated I was happy to never do ink washes ever again - until now. All my students got new pens, tips and their own black ink bottles. I purchased some colored inks for them to share. Some of my students went right to work and are enjoying the old school methods of creating ink drawings - others discovered the convenience of using modern, disposable pens.